If you are a working man or woman, odds are that you are finding yourself standing up straight for long hours every day, week in and week out. Sometimes for 6 days a week. You might be a construction worker, a pastry chef, a retailer, a police officer or a nurse. No matter your occupation, if you’ve come to this page to find the best shoes for standing on concrete all day, you’ve come to the right place! Anyway, all of the previously mentioned jobs require standing up for long hours. These jobs are hard on even the toughest of us. And if you have such a job, then first of all… kudos to you for taking on one of the harder jobs! Second of all, you’re going to have to invest in really supportive footwear. That way, you can rest assured that you are giving your feet the best possible treatment. Not only will it feel good physically, but you’ll also feel good knowing you’ve done everything in your power to ensure the future health of your feet! The sooner you invest in supportive footwear, the better off you’ll be. Never underestimate the amount and severity of the foot conditions that are out there. For instance, you could get plantar fasciitis, metatarsalgia, achilles tendinitis, bunions, calluses, ingrown toenails, heel spur, etc. All of these are very painful conditions, which take a long time to treat, but are easy to prevent. You might as well save up for good shoes for standing all day, because developing foot conditions and having to pay for treatment is easily going to be ten times more costly. Good shoes will save your life. What To Look For In The Best Shoes For Standing On Concrete All Day? Standing up all day takes its toll on your feet. It is essential that you buy shoes which will support you well. You are going to need some cushioning. Therefore, you need to get quality shoes which have a really good midsole. The midsole of a shoe is the part of the sole in between the outer sole and the insole. In other words, the midsole is the part of the shoe that you don’t see, but which you are, in fact, actually standing on. Not all midsoles are created equally. Cheap shoes have cheap midsoles. Avoid those. They won’t last long and they won’t give you decent support. Plenty of people have either low arches, which makes them over pronate, or high arches, which make them under pronate. If you’re lucky, you’ve got perfectly normal feet which don’t have any of the aforementioned problems. But even when you’ve got normal feet with no over/under pronation, then it is still important that you get the proper arch support. Stock insoles are never, ever going to give you as much cushioning and arch support as third party (aftermarket) insoles. If you are dead serious about standing up straight comfortably all day, then you are going to do yourself a huge favor by buying a good pair of insoles along with your shoes. Personally, I am very happy with my Tread Labs Stride insoles. The best shoe inserts are custom orthotics. Custom insoles are molded to your feet, hence the name. These are the best, but they are also the most expensive. It all depends on how serious your current foot condition is. For people suffering from, say, plantar fasciitis, it can certainly help to get custom insoles made. Although it should be noted that custom made insoles won’t always be a perfect fit. If you do manage to get them to fit perfectly, they will help heal your feet faster. But if you aren’t currently dealing with a painful foot condition, then a pair of good aftermarket shoe inserts are probably going to be good enough. A lot better than your stock insoles, anyway. Your feet deserve protection and comfort, especially if you work on hard surfaces for long. The Skechers Soft Stride is a pair of rugged, lace up pair of work shoes with mesh, synthetic uppers and leather for guaranteed softness. A lace entry ensures a secure fit while the internal fabric lining gives you a smooth feel. With a shock-absorbing midsole, you can work comfortably without the usual fatigue experienced when working in other shoes. These shoes are super comfortable, thanks to the additional memory foam. They don’t even require extended periods of time to break-in. Amazon reviewers also appreciat the warmth they offer to their feet, especially on cold surfaces. The fit is perfect, and they make for nice winter shoes. This is the type of safety shoe needed for a working person’s feet. when it comes to Skechers 70727, comfort comes first. They are electrical-hazard rated. The toe box is composite, to ensure your toes are well protected and can wiggle freely. If you do a lot of standing on concrete floors, then this is the perfect shoe for your work environment. With a snug fit, the shoe is more comfortable than it appears. The section of the shoe close to the ankle, slightly extends above the ankle. This is a benefit to the wearer, since the shoe provides more stability this way. These shoes have not been fitted with a steel shank. Therefore, they can easily flex like a normal shoe. Additional comfort is provided by the memory foam insoles. You will immediately feel that comfort, when you put them on for the first time. Whether you are wearing them for your outdoor adventures, or simply at your workplace, these shoes will serve you for a long time. They provide good arch support, are lightweight, and are available in different widths. You can wear them when digging ditches, when walking across rocky trails or even out there in the rain, and they will hold up perfectly. If you work on your feet for long, or in situations where you are at risk of falls, such as construction or medical work, your body is constantly exposed to high stress and possibly chronic body pains. Therefore, you need the right pair of shoes, to prevent or minimize such risks. A slip-resistant shoe is what you are looking for. Fortunately, the Skechers for Work Men’s 76690 Keystone Sneaker, has been designed for precisely these kinds of situations. It kind of looks like a running shoe. But it’s most definitely very suitable for working conditions. It’s designed not only to look good, but to give you comfortable support all day long. The shoe is available in white and black, although black tends to be more common with most buyers. It is described as a work shoe, with generous support and cushioning. This means that it fits perfectly for all you hard working people who are looking for the best shoes for standing on concrete all day long. It features a slip proof outsole that is generally sturdy. It has leather uppers and a strong lace up design. It’s just a really thick build. The shoe promises to fit snugly and comfortably every day, all day. This is partially thanks to the removable PU footbed and EVA midsole. The rubber sole provides really good support and traction. This is a work shoe that will keep your feet grounded and comfortable. If you weigh over 400lbs and you work an average of ten hours per day, then you understand how tough it can be finding the right shoe. However, once you’ve bought this pair, you will understand why it never worked out with other shoes. 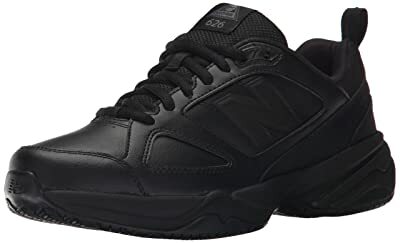 The Skechers for Work Men’s 76690 Keystone Sneaker was made for your feet. With a sturdy shoe design, do not expect any signs of wear and tear any time soon. It is a shoe that has been manufactured for durability. They are very comfortable, you can wear them all day, and they are definitely worth your money. Your workday can be long and tough. And that is why you need clogs that are comfortable and easy on your feet. These shoes are lightweight to ensure you can navigate your work environment with ease. They come with an EVA upper that is both flexible and durable. The cushioned footbed is removable, so you can replace it with another pair of insoles. But it’s still pretty good out of the box. It can keep your feet comfortable around the clock. Additionally, the outsole is slip resistant, thereby giving you secure footing when exposed to different surfaces. Recommended for recreational usage and work, the Skechers 76778 Balder Slip combines comfort, functionality and style in an affordable and lightweight package, that you will surely appreciate. Designed with a stylish black theme, which can be easily enhanced with polish, it can be comfortably combined with official wear. The shoe has been manufactured with durable and light synthetic materials. On the other hand, the rubber outsole is stylish, flexible and designed to endure everyday use (or in some people’s case, abuse). The sole also minimizes shock and stress placed on the feet, which protects the user from injuries. The Balder has ventilated ports for keeping your feet cool. It is also slip resistant. Other comfort accessories include the padded collar and a shock-absorbing foot bed. With such a combination of features, this shoe stands out among the best shoes for working on concrete floors. It comes with footbeds that are very well made. The shoes are easy to clean and the insoles can be replaced with a pair of of your choice. The Skechers for Work Men’s 76778 Balder Slip Resistant Work Clog is an award-winning shoe. It is budget friendly, made from quality materials, and it isuniquely designed. If your job is demanding, requiring you to stand on concrete all day, then this is the type of working clog that you ought to own. Skechers is a brand known for stylish, high performance and comfortable shoes. The Feltons are work shoes designed with leather uppers, featuring a lace-up casual comfort. These hardy shoes also come with memory foam cushioned insoles and OSHA compliant, rubber, slip resistant outsoles. A golden combination that will guarantee protection, durability and top-notch comfort. You will feel confident while working in these shoes. Comfort and added safety ease you through a demanding schedule at work thanks to the Feltons Work Relaxed Fit from Skechers. The upper is made of synthetic leather that is smooth and stylish. For durability, the stitched steams have been reinforced. This is to ensure that the shoe will last longer. The shoe also has front, heel and side overlays. It also has a padded collar and tongue, for preventing external material from becoming internal material, if you catch my drift. The shoe lining is made of soft lining. Therefore, you can wear this shoe all day long without getting any blisters. A roomier, more comfortable fit have been added to the design to guarantee optimal comfort levels. The shoe is available in various widths. They are ideal for workers in the medical world, culinary arts, hospital industry and numerous other fields. A chemical, slip and oil resistant rubber outsole protects your feet and improves footing control. If you work on your feet all day, you need a comfortable and durable shoe. You don’t have to feel like you are wearing bricks on your feet at the end of the day. That is why Skechers came up with this shoe to help you through those long hours. These shoes fit right out of the box, with a minimal break in period required. When you buy them, it will probably be one of the best bargains you have ever come across, in terms of working footwear. On some days, it might seem like the day will never end. But at least you’ll be standing comfortably, in Skechers for Work’s Feltons. Keep your footing slip-free and in-gear with the Skechers Softie Lace-up shoe. The lightweight midsole ensures ease of movement while the breathable lining keeps your feet dry and cool. A smooth leather upper provides you with flexibility and comfort, when doing your shift. The rubber outsole, designed through high abrasion technology, is just ideal for changing conditions. Whether you spend much of your day standing on hard surfaces, or you commute a lot, you will definitely appreciate the combination of a comfortable fit, a cool style and the versatility offered by this work shoe. Handsomely designed with a flexible, soft leather, the upper features a padded tongue, full lace-up panel, collar and padded tongue and a handy pull tongue towards the heel. The perforated vents towards the sides allow for breathability. The rugged and thick slip-resistant outsole provides durability and traction. This man-made leather, non-slip work shoe, provides a balance between a work shoe and an athletic shoe. So often, ladies’ sneakers tend to come with a narrow sole that fails to provide the needed support. This shoe has been designed with a wide sole to provide you with the stability you need every step along the way. The shoes are very comfortable, and you can walk in them all day without fatigue. Additionally, your toes are not squeezed, thus allowing them to move freely at the toe box. They are also well rounded, giving you that wiggly feel. If you have wide feet, it is recommended that you buy the wide size for this shoe. They are super cushioned, and skid resistant. You can easily wear them in wet conditions. They fit perfectly and your heels, toes and arches will be grateful to you for having bought these. The insoles are removable. Therefore, you can replace them with your own if need be. They are stylish, comfortable and provide great support when walking on cement. For all you working ladies out there, finding the right pair working shoes is a challenge of finding the right combination of functionality, comfort and style. Most shoes definitely have style, otherwise nobody would look at them, let alone buy them. However, comfort and functionality is somehow left behind. The Work Women’s 76536 slip-resistant shoes manage to combine both style as well as functionality and comfort. It is designed for the working lady, with a job that requires standing on concrete for long hours, or simply constant mobility. The upper is made of 100% leather. Therefore, if you are looking for durability, then this shoe is a great option for you. On top of that, it features a smooth upper leather finish that is both durable and highly attractive. The exterior leather shell ensures breathability as well as air circulation, which makes sure that your feet are fresh all day. It also comes with a wide front, ensuring that your feet stay comfortable throughout the day. Another feature that makes this shoe unique is the rubber sole, which is slip resistant. This makes it a great option for both outdoor and indoor use. The authentic rubber soles are highly durable. This ensures that this shoe will serve you for long, without the need for a replacement. The skechers 76536 don’t come with laces. With this slip-on design, you spend less time putting on and removing the shoe, which is very handy for when you have to rush to work. The heel also comes with a pull loop for making it easy to wear. The internal part has a soft fabric lining, keeping your feet comfortable and warm. These Skechers Sure Tracks have been fitted with a padded, shock-absorbing insole. This is a feature commonly found in athletic shoes. This makes sure that the foot experiences minimal pressure from the surface underneath. The sole supports the whole foot, so you can maintain a neutral position when you are standing for long hours. It is one of the most comfortable shoes for standing on concrete floors all day. The Eldred non-slip shoes provide comfort and sure footing, when you are working your job. They feature slip-resistant rubber outsoles for providing traction on oily and wet conditions. For cushioning, the shoes have been fitted with memory foam insoles. The leather uppers provide you with much needed durability, while the fabric linings provide a soft feel. If you have wide feet that never seem to fit into anything, then the Eldreds will provide you with a nice fit. The shoes are very comfortable. You are not going to experience aching feet at the end of your shift. The memory foam will really help you out with your comfort levels, when working for long hours. The shoes are light as air, without much effort when walking. Comfort, performance, and durability are what you can expect from Skechers’ Eldred. If you work for 50+ hours a week, then you will understand the need for a comfortable pair of shoes. In terms of comfort, these are some of the best. The shoes offer the needed durability, when working in a fast-paced environment. To a certain extent, the shoes are waterproof, thus keeping your feet warm and wet-free. They are comfortable and lightweight. Standing on tile floors and hard concrete floors all day, can be strenuous. However, with these shoes, you can just forget about feet and back pain, thanks to the nice cushioning insole. The heel panel, smooth leather and upper mesh fabric, provide breathability and a cooling effect. The padded collar and the tongue have been added to provide comfort. For a roomier and comfortable fit, the shoe has been designed with a relaxed fit. It is electrical hazard safe, slip resistant and conforms to the demands of the workplace. It is a great shoe that can be comfortably worn all day. Safety and comfort are important factors to consider, when buying a work shoe. If you are looking for both, including much more, then you should get yourself a pair of Skechers for Work Women’s 76578 Bungee Lace-Up Sneaker. These shoes have very nice arch support, including overall foot stability. The style is flattering and sleek, on top of being lightweight. If you stand a lot, then these are the perfect type of shoes to work with. The grip is superior to many other work shoes on the market today. With these babies, there is no more slipping and falling when walking on slick surfaces. They are lightweight and will give you great mobility. Another bonus, is the soft and padded memory foam insole. Since they are slip-ons, they will save you a huge amount of time, when you need to get to work fast. The inside lining of the shoe is made of neoprene lining, which makes them wrap around your feet snugly. They are highly recommended for any individual looking for non-slip shoes which are also stylish. The only regret you will have, is not having tried them out sooner. The sole is soft and light, which makes you feel as if you are walking on air. They are comfortable and sturdy, in such a way that they can withstand even the most rugged work environments. Breathability is another benefit that comes with the Bungee Lace-up. As previously indicated, they are slip-ons. Therefore, whenever your shift is not tight, you can easily slip them off, and allow your feet to breathe. As soon as you’re up again, you can put’em on just as quickly. They don’t retain bad odors. Additionally, they are highly affordable. If you are looking for a shoe that you can fit on quickly, is comfortable, lightweight, and durable, then the Skechers for Work Women’s 76578 Bungee Lace-Up Sneaker should be your first choice. They are perfect for all work conditions. If you are looking for comfort, style and durability, then the Alegria Chairman clog is the right shoe for you. The Alegria Chairman professional clogs come with a swivel strap. This strap can be converted easily to form a sling-back shoe. With a stain resistant upper, the shoe is easy to clean, since it does not collect any stains. The leather lining keeps moisture away. The removable cork, memory foam and latex footbed, gives you the cushioning you need for a long work day. This shoe also has a nonslip and mild outsole, perfect for the workplace. The shoe is lightweight, quick to put on and comfortable. The style is anatomically correct for providing support and ensuring good posture. The suede sockliner and the leather upper lining are cool and breathable. At the same time, they prevent the shoe from accumulating bad odors. The shoe fits like a designer shoe. The upper is made from premium leather, which is available in a range of finishes. The insoles are thick, removable and soft. They adapt to the shape of your foot, after wearing them for a few days. Since the insoles are removable, you can replace them with your own, in order to create enough interior room while also having the support you desire. They can be described as orthotic-friendly and non-marking, especially when walking on tile floors. These clogs will never disappoint you. They are true to size and available in a wide width. Good news for those of you who like wearing thick socks. No break-in period is needed since they are very supportive and soothingly comfortable straight out of the box. Their construction is top-notch: long lasting leather will make sure they can service you for years on end. Many working people, who spend much of their day standing on concrete, prefer these shoes. They are easy to put on and remove, making them suitable for any sort of work environment, really. If you suffer from back pain and sore feet, it is time for you to consider these Alegria Chairman shoes. If you are on your feet all day long and you want to leave your workplace feeling great, then this is the right shoe for you. The Alegria Men’s Spock features a stain-proof leather coating and a slip resistant lab rated outsole. The lace up feature allows your feet to fit securely in them. The leather-covered insole ensures that your feet breathe naturally. This leaves your feet feeling fresh and dry. The shoes feature an upper made from full grain leather as well as the suede sockliner, breathable membrane and the moisture wicking leather lining. The memory foam, latex and cork loaded footbeds form a perfect fit underneath, by contouring around your feet. This feature offers the wearer cushioned comfort and an individual fit. The footbed is also removable, which means that you can use your own orthotics. The polyurethane and lightweight midsole has been designed to reduce central metatarsal and heel pressure. It acts as a shock absorber as you move through your gait cycle. The shoe is hand woven, with a superior arch support, leather lining, and a roomy toe box. A full, flat ground contact bottom provides the shoes with more stability. The slip resistant outsole on this shoe gives you sure-footed confidence, for every hour you spend at your workplace. They are highly durable, comfortable, and light. On top of the good looks, the shoes also feel great on your feet. You can perform any activity you like for as long as you like, without feeling pressure points or similar problems. It is recommended to give the shoes a few days to break in. After the break in period, you will have a pair of comfortable shoes, that you can wear all day and every day. The shoe is suitable for casual wear. It’s a perfect shoe for working in areas with occupational hazards, due to its ability to provide support and comfort. The Alegria Schuster professional is a perfect shoe for daily wear. The shoe comes with a collapsible back heel, which allows you to wear it as a closed black shoe, or an open back slide. This implies that the shoe can be used as a clog or a loafer. The upper is made of stain resistant leather, which makes cleaning and maintenance easy and quick. On the other hand, the removable cork, latex and memory foam footbed keeps your feet comfortable and feeling nice. The footbed also contours to the foot’s movement, giving you a natural gait. The shoe has also been designed with superior arch support, to provide your feet with additional comfort. The outsole is made of slip resistant polyurethane that gives you the traction and grip that you need when walking, regardless of the terrain you currently find yourself on. If you have been suffering from plantar fasciitis and are looking for the right shoe, then the Alegria Schuster is highly recommended. Additionally, if you spend long hours on concrete floors, then you understand the need for a comfortable pair of shoes. These shoes feel and fit great, keeping your back and feet pain-free. They are also stylish, which means you can combine them with different outfits, without looking out of place. The insoles are removable, which means that the shoe can accommodate orthotic inserts. With this shoe, you are always walking with comfort. The material making the upper is full grain leather, for guaranteed durability. The Alegria Schuster are some of the best work shoes you will ever own. These shoes have been tried and tested and their performance has never been disputed. The shoes are easy to slide in and out, which can save you time when you need to get to work in a big, big hurry. If you have narrow feet, it is recommended that you order a half size smaller. If you have wide feet, you should order a half size larger. Standing on concrete all day does not have to be a painful affair anymore, thanks to the Alegria Schuster professional shoes. Alegria is a footwear brand renowned for producing shoes with unsurpassed comfort. They are the go-to footwear brand for professionals in the service industry such as chefs, nurses, and waiters. If you spend most of your time standing on concrete floors, then the Alegria Dayna Professional is an excellent choice. These shoes offer high levels of comfort, shock absorption, and superior arch support. Apart from their superior comfort and support, these shoes are also stylish and fashionable. They come with uppers made of 100% premium leather, which helps to protect your feet against various substances. The leather upper is also stain-proof for easy cleaning and maintenance. On the other hand, the moisture-proof interior ensures your feet have a moist-free environment. Also, they feature a hook and loop closure, which helps you to obtain a perfect fitting. One of the most outstanding features of these shoes for standing on concrete is the soft-foam footbed. It’s cushy and removable. Therefore, if you normally use custom orthotics for various reasons, then these shoes are a perfect match. Its polyurethane rubber outsole provides traction and grip, as well as stability, especially when you are walking or working on slippery floors. The use of a Rocker outsole plays a vital role in promoting natural motion while reducing metatarsal and heel pressure. The spacious toe box and the padded collar supply additional comfort while the leather lining gives you a pain-free and blister-free wearing experience. If you are a nurse or you work in a professional kitchen, these shoes will help your feet remain comfortable the entire day. And if you suffer from conditions such as bunions, hammer toes, arthritis or plantar fasciitis, then these shoes are recommended. When it comes to foot pain prevention, durability and comfort, nothing compares to the Alegria Women’s Debra Professional Shoe. This shoe has an outsole that provides shock absorption and prevents ball of foot pain and arch pain. With added benefits of heel protection, you are definitely buying one of the best shoes for working all day on concrete. The slip resistant outsole prevents slipping, falling, and similar accidents, that are very common on wet, soapy, or oily work conditions. The shoe perfectly meets the needs of doctors, chefs, nurses and other professionals, whose work entails walking and standing all day. It is designed for professionals. It is a stylish and comfortable shoe to wear for work. Long hours of walking and standing can be tough. However, the Alegria Women’s Debra Professional Shoe comes to the rescue and helps you bridge the gap. The shoes are available in European sizes, therefore, you will have to use a reference conversion table that suits your locality if you deem it important that they fit well when they arrive on your doorstep. The shoes are full grain leather upper while the sole is man-made. The leather used to make these shoes has been certified as stain proof. This makes the shoes easy to clean and maintain. Stylish contrast stitching has been applied to these shoes, which adds to their overall appeal. The heel and platform are slightly raised to conform to the ankles, legs, and feet of women. Just like other shoes from Alegria, the Debra Professional shoe is cushioned, soft and comfortable, which makes it suitable for long hours of work. Good shoes for concrete floors should be lightweight, and this shoe certainly fits the bill. They come with a removable latex and memory foam footbed. Therefore, if you want a slight variation, you can insert your own insoles the way you prefer. With a mild rocker outsole, the shoes have been designed to roll naturally. They provide you with natural walking motion, allowing for a better posture, minimal stress on joints and legs, and an overall comfortable working day. Alegria is designed with technical features that promote wellness and health. Its simple ergonomic construction and slip on design will suit your everyday lifestyle. A heavily padded footbed makes you feel like you are walking on air. Manufactured with leather and available in a variety of finishes, Alegria brings style and design closer to you. The Alegria Women’s Keli Professional Slip Resistant Work Shoe is a comfortable shoe that you can wear during your hectic and long hours. Available in premium leather, this work shoe has a padded instep, a wide toe box and a back collar that protects your feet from chafing. With a leather lining and a removable, perfect-fit footbed, the shoe offers premium moisture management and optimum cushioning support. Just like other Alegria shoes, the sole has been made with slip-resistant polyurethane for providing reliable traction control and to minimize the stress placed on the central metatarsal part. The mild rocker outsole has been designed to roll naturally. The bottom outsole aims at inducing a natural walking motion for better posture. It also reduces stress on the joints, muscles and back, leaving you with all the energy needed to make it to the end of your work routine. A perfect footbed is another feature that makes this shoe highly sought out. The shoe is comfortable, with a patented interlocking system at the footbed to provide arch support. This, combined with the latex, memory foam and cork footbed, will allow you to stand on concrete all day. You might want to try this shoe out if you are diabetic. And if you are, then you will understand how hard it is to find shoes at a reasonable price. However, the Alegria Women’s Keli Professional Slip Resistant Work Shoe is indeed available at a highly affordable price. They are lightweight. You will only need a day or two to get used to them. The sizing is perfect. They are comfortable and incredibly snug. You’ll likely love these right from the get-go! Whenever you choose a Rockport Work Shoe, you can always expect protection, on-the-job performance, and legendary comfort. Designed with ADIPRENE technology, this shoe absorbs shocks throughout the heel section, while providing rebound energy at the front. The outsole cushions the heel strike, providing a smooth roll with each step you take. The shoe flexes easily and gives you amazing comfort. With a truWALK outsole and ADIPRENE by adidas, these two technologies combine to produce a work shoe that feels and performs like a running shoe. The shoe is comfortable. The amazing quality shows that this is definitely a fully-fledged work shoe. If you are wearing these shoes on a concrete factory floor, you will appreciate how light and comfortable they are. The shoes fit perfectly and will hold your foot in position. The outsoles are high quality as well, letting you walk softly on hard ground. The shoes are extremely rugged, last for long, and they will offer full protection to your feet, thanks to the steel toe. If you work in the construction industry, you will love them for this. If you decide to spend your hard earned money on these shoes, you can be sure that you will own a pair of solid work shoes that will serve you for long. They will likely last multiple years, so you won’t have to replace them every year. The make and feel of these shoes is excellent. They are perfect for people who are looking to buy shoes for working concrete floors. If you are looking for an ultra-protective and a lightweight shoe, with a toe box that does not impede toe movement, then this might very well be a really great choice. The shoe delivers arch support, superior comfort, and foot protection. You will also love the cushioning and flexibility featured on them. The outsole is made of rubber, so it will perform well on any surface by maintaining high levels of traction. The shoe is highly breathable, allowing your feet to feel fresh all day. You don’t have suffer from tired and painful feet any longer, thanks to the Rockport Work Men’s RK6761 Work Shoe. Rockport Works produces a line of top quality occupational footwear, that enables an easy transition between home and work. RockPort Work boots feature waterproofing, steel toe protection and metatarsal guards that will keep your feet safe. The Rockport RK465 offers similar features and much more including slip resistant outsoles. They come in casual, oxford and classic styles. Rockport work boots offer you protection and style at a wallet-friendly price. The Rockport RK465 is designed to keep you safe and comfortable on the job. As indicated above, it features an internal metatarsal guard and a composite safety toe to keep you protected when working. The composite toe has been made from a non-ferrous, elastomeric material designed to withstand compression and impact of up to 75lbs. The metatarsal guard provides the instep area with the required protection. For comfort, this work boot has a moisture wicking lining. Additionally, there is the removable EVA cushion insert, together with rebounding footpart pads and Adiprene shock absorbing heel. All in all, this is the type of work boot that you need for squeezing out your best performance at work. If you are looking for sure-footed support, back-saving comfort, and protection you can rely on, then you need the Women’s Rockport Works RK465 Work Boots. The shoe also features electrical hazard protection to handle all the dangers at the workplace. The dual-density polyurethane midsole and the full grain leather uppers gives this boot the flexibility and durability that you’d expect from a work shoe. The extra wide toe area and the shock absorbing traction bottom, provide you with the needed on-job flexibility. The Women’s Rockport Works RK465 Work Boots are some of the most comfortable work shoes you can find today. You can even wear them in the rain, and your feet will remain dry. The feet feel great, they provide good support, they fit perfectly and they are lightweight. And that’s a pretty darn good bonus, if you plan on wearing them all day. If you want to feel relaxed, but still have protection on your feet, then these Rockport Sailing Clubs suit the equation perfectly. You can never go wrong with this pair of shoes. They are lightweight, comfortable and a perfect fit for any work environment. It is a work shoe that appears casual, but is actually a work shoe. And a stylish one at that. They will definitely earn you a compliment or two. With a casual look, it is hard to notice the added protection features on the Rockport Works Men’s Sailing Club 3 Eye Tie Boat Shoe. They can be used in a professional office environment or a rugged outdoor work situation. The Rockports are surprisingly supportive and super comfortable, for a shoe that is low cut. When walking on slippery floors, you will notice how the sole adheres to the surface very well, without slipping as much as a quarter inch. In addition, there is a steel toe, which tends to be a great bonus, especially when working in areas with work hazards such as heavy falling stuff. You may want to get them in a slightly larger size, because with shoes as awesome as these, you’ll want your foot to fit perfectly. Good shoes for concrete floors should have a sturdy outsole, while at the same time being light enough. And that’s precisely what these shoes offer you. The outsole is oil and slip resistant. Therefore, if you are constantly working on messy concrete floors, then this is a perfect shoe for you. This shoe is also perfect for people working in electricity-related environment, due to the electrical hazard protection and CSA electrical shock resistance. It is made of high quality grain leather, which will protect your feet against chemicals, detergents and other spills that you might experience at your work place. They are durable and will last you a very long time, even with daily wear. If you are looking for all day safety and comfort in style, then you really can’t afford to miss out on this boat shoe. This shoe combines both style and functionality into a holy matrimoney, that will make you rock your work floor, no matter your occupation. Whether you just need a pair of professional clogs, or you have already worn Dansko’s shoes before, then you may want to try out the Dansko Men’s Pro XP Mule. If you are new to this shoe, then you will appreciate its practical features and its high level of comfort. The midsole area has a steel shank for increasing stability during lateral movement. Additionally, the uppers are water-resistant and it has a very roomy toe box. The shoe is available in 9 different finishes and colors. The uppers of these shoes have been made from high quality leather. For additional comfort, the shoe has been fitted with padded collars. If you are looking for a good shoe to wear when standing for long hours, then the Dansko Men’s Pro XP Mule is highly recommended. They are fairly lightweight, which is a good thing if you like moving around. They fit perfectly, thus making them some of the best shoes for concrete surfaces. The heel is structured in a way so that it adds the perfect balance, even when working on slippery floors. The Dansko Men’s Pro XP Mule are incredible shoes, even for nurses who spend long hours alternating between shifts. If you work in a professional kitchen, then these shoes will provide you with the ideal support, for your feet and back. With legendary comfort and excellent arch support, these shoes will allow you to stand for long periods of time, without the fatigue associated with normal shoes. They shoes come with a memory foam and dual-density EVA cushioned insole, for pampering your feet and offering support. The Dansko work mules are pretty cheap. They last long too, so they are very affordable and a solid investment for someone who is in dire need of good shoes for the work floor. They are recommended for people who work long hours, regardless of the environment. The Dansko Men’s Pro XP Mule has been designed to ensure that your feet remain snug and comfortable from the beginning to the end of your work day. This shoe is perfect for gents looking for stylish shoes that can be worn on a day of standing up on your feet for 10 hours in a row. They have been designed with the latest technological trends, to provide enough comfort to the wearer for the whole day. They are stylish enough to complement any type of clothes. Additionally, they are suitable for all occasions, not just work scenarios. They can be purchased in either black or antique brown. As such, you have a wide variety of clothes to choose from when combining them with these clogs. They come with several unique features, that make them a really great choice for standing on concrete for a whole day. The Dansko Professional Oiled clogs have been manufactured from full grain leather. This material ensures that your foot is properly secured inside the shoe. The material also prevents unnecessary internal movements, which could lead to blisters. The tough leather also makes it waterproof to a certain extent, thereby making it a perfect shoe for wearing during the wet season. The leather upper also allows breathability during and after use, preventing the presence of any bad odors. The biggest advantage of this pair of shoes is its durability. You are going to enjoy wearing this shoe for several years, without having to replace them too quickly. Another main benefit of this shoe is the ease with which you can slip it on and off. Whenever you get a light break during your shift, you can let your feet breathe. Additionally, if you live in the backcountry, where you will need to remove your shoes often, then this is the perfect pair for you. It is a firm-fitting shoe that provides excellent arch support. If your job requires standing for extended hours, then these shoes will prevent you from getting sore feet or back problems. The clogs are some of the most comfortable shoes you will find today. Dansko’s products are made with the best construction methods and finest materials available. This clog is designed in a way that provides maximum support for protecting your back, heels, and feet when standing straight up for long hours. In light of this, your body is able to stand up for longer without experiencing premature exhaustion. When you are a shift worker going through different rotations from one place to another, you are always going to encounter a time of the day when your feet are starting to feel uncomfortable. With uncomfortable feet, your productivity goes down the drain. And that is why you need comfortable shoes. This shoe comes with a unique shape. It’s designed to be anatomical, following all the curves on your foot. The upper part has been designed with high quality leather, with an instep collar that is generously padded to give you even better support. If you are looking for a shoe with superior shock absorption, then you should definitely consider the Dansko Professional Clog. It has been fitted with polyutherane outsoles, which are both durable and dense. The bottom sole has a wider heel. It’s been designed to propel the foot forward, ensuring greater stability. All of the features put together will make it so that you can enjoy fatigue-free days more often, due to better standing comfort. A really good shoe for standing on concrete floors, should have a roomy toe box. The thermoplastic polymer and the sturdy design of this shoe add durability, toe protection, and sufficient space to move your toes. The breathable footbed and leather sock lining wick away perspiration. On top of that, the sock liner comes with antimicrobial properties, which prevents bad odor from accumulating. These shoes are widely known for their style, quality, and comfort. The shoes are well constructed and they have been known to serve wearers for many years. With strong stable frames, strong heels and rich textiles, you can be sure that you’ll get lots of bang for your buck. Amazon buyers who have worn and reviewed these shoes, love them most for their comfort, safety, and durability. If you spend long hours standing up at work, then you need a comfortable shoe that can support your weight, without transferring that pressure to other parts of your body. The Dansko Women’s Professional Tooled Clog offers that and more. With a leather upper and a gorgeous embossed design, the Dansko provides you with all the comfort features you could ask for. It is one of the most suitable shoes for walking around on concrete floors all day. A high toe box provides your toes with much freedom, which is super important for for natural movement. The foam midsole and the padded instep, give you cushioned comfort. It also comes with a leather lining that contributes to an overall smooth feel. The polypropylene inner frame and the protective heel counter provide the stability that you need, no matter the surface you are working on. The rocker sole ensures a firm traction to give you stability, during your busy schedule. This shoe fits snugly, just so long as you order the right size for your feet. It leaves sufficient space for your toes to move freely. At the same time, the back part of the heel is loose, allowing your heel to have up and down motions, without becoming all blistered. When it comes to shock absorption, too many shoes on the market are lagging behind. The good news is that shock absorption, which was originally found only in sports shoes, is now also found in the Dansko Women’s Professional Tooled Clog. These shoes can absorb all the impact energy that occurs when walking in them. This gives you the much needed comfort to attend to your daily duties. With a comfortable heel and platform, and formidable arch support, you are simply going to love this clog. Dansko Women’s Professional shoes comprise both style and comfort, with every single pair of shoes, clogs or mules. Every pair is infused with the greatest comfort Dansko was able to manage. These are among Dansko’s best clogs. They will service you for a long time if you let them. This excellent shoe from NB is designed for people who spend much of their day standing. If offers durability and a great fit, and it comes with a new slip-resistant design. If you work hard, then you should have a shoe that supports you in your work. The New Balance Men’s Mid626K2 Training Work Shoe comes with supreme cushioning, traction and support. These are very suitable shoes for standing on concrete all day. For technicians, the shoe is under constant exposure to oil, soap, and an assortment of other chemicals at the workplace. It has a thick sole with good support, so that the weight is not transferred to your feet. They require a very short break-in period. The New Balance Men’s Mid626K2 are very comfortable shoes that can be worn all day. They come with great non-slip soles, which lower your exposure to any safety hazards you may encounter at your work. You can use them for many years, without the need for a replacement. They will still serve you with the highest level of support all that time. The upper part of this shoe is fully breathable and comfortable; thanks to the EVA firm footbed. This footbed, combined with the internal shank ensures that the wearer gains stability, support, and cushioning, no matter which activities are undertaken. The shoe comes with a 10mm drop design. The outsole is non marking, which keeps floors scuff-free. The Mid626K2 is also perfect for people with wide feet, since it is available in various widths. 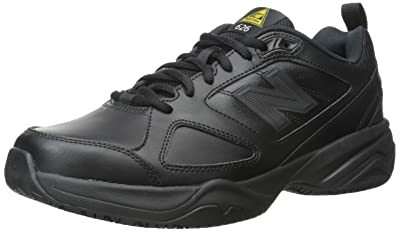 If you are looking for a shoe that is slip resistant on concrete floors and safe for working in hazardous work environments like hospitals, and professional kitchens, then this would be a good option for you. It is highly durable, long lasting and super-comfortable. Forget about feeling fatigue or joint pain. These babies will help you stand tall and firm, comfortably. The New Balance Women’s WID626V2 Work Shoe features slip resistant technology and super good cushioning. It comes with a leather upper, which enhances your breathability and comfort. The internal shank and ABZORB midsole, provide maximum support and shock absorption. It is also an ideal shoe for moving around. It is lightweight, thanks to the Phantom liner. New balance is a company that is highly reputable in designing shoes that fit the wearer. If your job has you walking on concrete all day long, then these shoes will serve you well. If you have flat feet, then you can put your own inserts into these shoes. They are very sturdy, and you can comfortably stand in them the whole day. The toe area is wide enough for different feet sizes, fitting snugly with each instep. They require a very short break-in period. You can easily do that when running some small errands at your local supermarket. You are definitely going to fall in love with the fairly stiff, supportive, and wide outsole. You will not experience any toe curling or ankle twisting, once you’ve got the WID626V2 on your feet. The New Balance Women’s WID626V2 Work Shoe offers great flexibility. The insole is removable, so you can replace their support with the support from your personal favorite insoles. On top of that, the shoelaces fit just right. You won’t have to double knot them, or have to retie them during the day. You can wear these shoes for a very long time, without ever developing painful feet. If you are looking for shoes that will have you standing on concrete comfortably, then these are the shoes to go for. They are available in various sizes, so they are bound to fit you, too. Standing or walking on hard floors such as concrete for long periods can have a negative effect on your body. It can lead to pain on your feet, ankles, knees, and back. Thankfully, if you have the right type of shoes such as the Clarks Grand in, you can easily avoid the pain that comes with standing on concrete for many hours. Whether you are a factory worker or a waitress, these shoes come with the right support features to help you avoid foot, leg, neck and back strains. They are designed for everyone who spends more than 8 hours walking or standing on concrete surfaces. You will also love the versatility of these shoes. You can combine them with different outfits, and then wear them to formal or casual occasions. Featuring 100% leather uppers, these shoes are not only comfortable but also durable. Most of the upper sections are double stitched to enhance the sturdiness of these boots. Their padded collar provides more comfort while eliminating chafing. And most importantly, these boots are incredibly comfortable. They come with Ortholite footbeds, which provide a soft landing cushion for your feet. Furthermore, these footbeds are removable, in case you want to use custom orthotics. You have probably worn shoes that left your toes feeling cramped. Well, such problems are unheard of when it comes to these shoes. They have a spacious toe box, which gives your toes enough room for splay. When you are working or walking on concrete floors, there is a high chance that you will come across slippery surfaces. But as long as you are wearing these boots, you are safe from slipping or sliding hazards. Their flexible TR outsole supplies adequate traction and grip regardless of the surface you are walking on. Also, the outsole provides further stability, while protecting your feet from sharp objects. Standing on concrete floors should no longer scare you, as long as you have gotten yourself a pair of Clarks Grandin. The Clarks Wave Trek have been designed with good looks, comfort and WAVE walking technology. The shoes are fully waterproof, with a full-grain, weather-ready leather upper. The interior part of the shoe is lined with soft fabric to provide the shoe with all-round comfort. Its curved rocker outsole cushions impact, conserves energy and absorbs shocks, allowing your natural momentum to drive you forward with gusto. Comfort is everything, when it comes to finding good shoes for working on concrete floors. With a roomy toe box, there is enough space for your toes to move around freely. Additionally, if you have been suffering from plantar fasciitis, you can use your own orthotic inserts in these shoes. However, the shoes are still comfortable even without the addition of other inserts. They can allow you to stand for an entire day without experiencing any pain. You can wear them in summer or winter. Rain or snow. The tough, long lasting and waterproof leather uppers keep your feet dry and warm when you are going through water puddles. The Clarks Women’s Wave Trek Sneaker have been fitted with EVA midsoles for cushioning your feet, absorbing shocks, and providing gentle support. The nylon shanks supply support and stability, even on uneven terrain and hard surfaces. These shoes are available in different colors. This will make it easier for you to complement them with your current wardrobe. They are great work shoes that can also be used in an urban setting. Heck, you could even take them on a dayhike if you wanted to. They are lightweight, breathable and waterproof. For most people, these shoes will fit well straight out of the box. They require a very minimal break-in period. For a better fit and support, it is advisable to use the full lace-up. They are comfortable shoes that you can wear at work all day long, without having to fear painful feet. The shoes are stylish, roomy and provide great arch support. They can be worn both outdoors as well as indoors. I have invested many hours researching the above guide. I hope you have enjoyed it. There is much more information about walking shoes here on the Boot Bomb, so by all means… stay a while! Got questions? Got answers? Got anything on your mind at all? Then by all means, let’s hear it! 1 What To Look For In The Best Shoes For Standing On Concrete All Day? Your obviously paid by these vendors. Not to have mephisto, ecco and many others before these is ludicrous. Cheap quality shoes made in china that wear out in 10 weeks is poor advise. Thanks for your insightful response. Mephisto and Ecco are indeed excellent brands. However, I am not paid by these vendors. I do promote Amazon, as stated in the disclaimer in the footer of my site. Based on your suggestions, I’ve done some searches on Amazon and have found that they have plenty of Mephisto and Ecco shoes for me to review. I should really get around to doing that. Those brands deserve a spot on my site. I will see to it that it happens sooner, rather than later. Thanks again! Gravity Defy© have spring shock absorber systems that are not only comfortable and long lasting, but help your knees and back when standing and walking on concrete all day. Thanks for the feedback, Debi! They cost me $140 so yeah. At first they are good and comfy safety shoes. But the poor quality of the mesh, joints etc the shoe lasted only for about 10 months and now its totally broken in the inside. All stiches are wack. I check a fellow worker with same shoes and she has the same broken parts with mine. She only use the shoes for a month. Well she is a heavy lady. Next purchase i did was this blundstone brand. Mind you they are the most expensive steel toe shoe i bought in my life for $200. I dont know if they are the best for me. I bought this because of suggestions from co workers but i think because i bought them for premium price, its just placebo effect that i feel good about it. Yeah i feel its as comfortabe as a new basic safety shoe. Its not like wearing an ordinary winter jacket then wear a canadagoose jacket. You will feel the price difference already. So yeah I saw a coworker wearing a legt csa tagged Reebok safety shoes and im like wtf reebok safety shoes? Really? I’m interested how this Reebok will perform. I remember i had good times with reebok rubber shoes. Will they make good safety shoes too? So and i will buy one of this since im not impressed with my blundstone. Thanks for taking the time to write up your valuable experiences and sharing them with me and my readers! Me and my readers are always eager to learn from other people’s real life experiences with footwear, so get back to me and let me know how you like those Reebok steel toe safety shoes, won’t you? I’ll make sure to do this correctly in the future. Tnx! Great tip you just gave me there, Mike! I love a good sneaker due to walking on cement floors. Adiadas Terrex with a good liner works well for me! Thanks for the great info I have trued the sketchers and they wear out quickly! I value the feedback of my readers a lot. Thanks so much for taking the time to drop your comment here! I’ve tried the Sketchers Work Men’s as well as the Kuru brand. Both seemed great at the beginning, but they did not seem to last more than a few months before my shins started bothering me. The treads were still fine, so any idea on how long someone can expect these shoes to last? You’re not the only one that wears shoes out quickly. I have a pair of running shoes that I walk, run and hit the gym in on a daily basis and after half a year… they’re done. However, if you’re looking to upgrade pretty much any shoe for long lasting support, then I highly recommend Tread Labs. These insoles are hard and will last forever. Been wearing them for 2 years and I’m loving them just as much as I did when I first put them in my shoes. What do you think of Joya shoes? I stand and walk on concrete for hours. I was not familiar with them until you mentioned them just now. I’ve taken a quick look on the web. They look interesting. I’d be totally willing to give them a shot if I were on the market for new footwear!